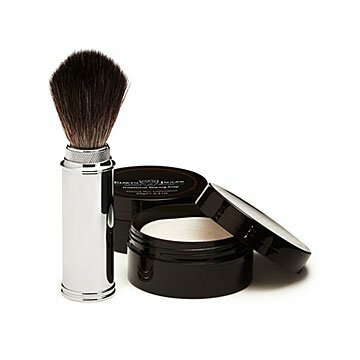 These jet setter-friendly shaving supplies will leave you feeling extra special. On the go? Bring luxury with you. A wet shave's a treat even when you're at home, so you'll feel extra special when you lather up with these jet setter-friendly supplies. Infused with a hint of real sandalwood fragrance, the specially formulated shaving soap works together with its partner, a quick-drying vegan brush, to soften and "lift" your beard. The result? A closer shave—and skin like an angel's. That's pretty masculine, right? Both tools come in cases ideal for travel, so you don't need to fret about how to store them… just about making your flight. Made in Sheffield, England. Gift Box: 5.2" x 5.2" x 4"
Shaving Brush: After use, thoroughly rinse the shaving brush in clean water. Dry shaving brush completely before storing it away. Sandalwood Shaving Soap: Ideal for normal skin. Use with hot water for a rich, luxurious shave.